I am looking for a voice recorder software for Android that would allow me to take notes which would be timestamped with respect to the recording. Cogi is an easy-to-use, free and ad-free note taking and voice recording app that allows you to capture only the important parts of meetings, lectures and conversations – all while remaining completing engaged, listening to what’s being said. Cogi puts you in control, letting you record only the “aha moments” from your conversation that caused you to think, “Gee, I should write that down”. 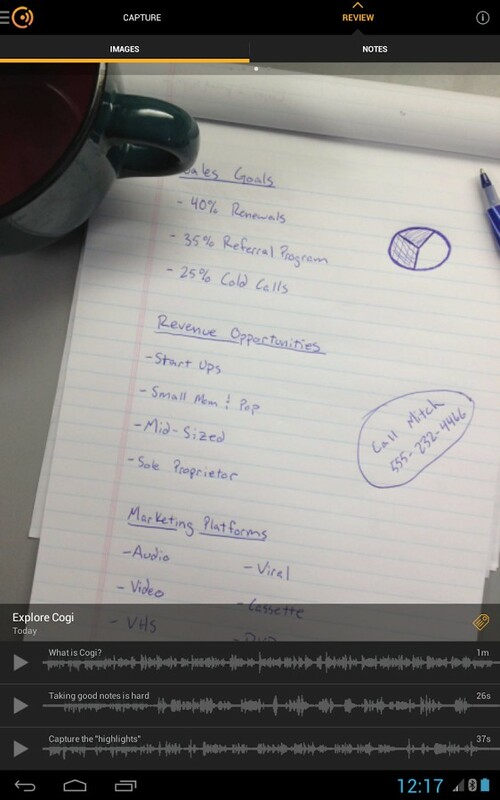 Rather than taking notes by writing them down, count on Cogi to record the important things you hear. Add images, text and tags to the voice notes to completely capture the details of any meeting or lecture. Review only the important highlights without listening to the entire conversation again. Not the answer you're looking for? Browse other questions tagged android note-taking voice-recording or ask your own question.